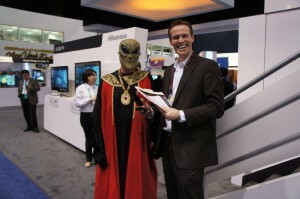 CES Day 2: Voxox Alien -- a Hit! CES is buzzing with awesome new gadgets and exciting news, but nothing's been quite as exciting as our very own Voxox alien roaming the show floor. Why? Well, perhaps because every 20 minutes during show hours the Voxox alien has been giving away free iPhones! 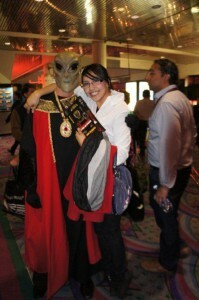 How it works: The first person within a 20 minute increment to locate the alien at CES and say "Speak Free with Voxox" wins a brand new iPhone 4! We've already given out dozens, and will continue to do so today. So if you're at CES, FIND THE ALIEN!! !